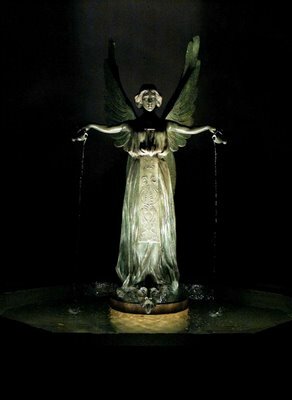 Angel fountain at the Missouri Botanical (Shaw's) Garden, in Saint Louis, Missouri. Water flows from ewers in the angel's hands and originally spouted from four dogs' heads at the base.The figure may represent Persephone, queen of the underworld, guarded by the dog Cerberus. Originally the sculpture stood in front of a marble column with overhead basin at the Skinker Avenue entrance to the 1904 Louisiana Purchase Exposition. It was then bought by David N. O'Neil and installed at the entrance to Lindell and Kingshighway Park entrance in 1907, and then moved south of the Field House in 1916. After suffering from vandalism it went into storage until its restoration in 1975 and now finally has found a home at the Missouri Botanical Garden.